Aquifoliaceae includes a single genus of trees and shrubs, which are widely distributed. Hollies are common landscape trees intemperate zones. Tropical species are equally attractive with dark green foliage and ornamental berries, but are underutilized in landscaping leaf extracts of certain species are used in beverages. Paraguayan tea is a high – caffeine drink made from ilex paraguariensis leaves are simple, entire, usually in whorls. Flowers are unisexual, with male and female flowers on different plants. Petal and sepals are 4-6, sometimes. The corolla is sometimes absent. Ilex includes approximately 400 species of trees and shrubs, which are widely distributed. Leaves are simple with more or less sharply toothed margins. Femala and male flowers are usually on different trees. Female trees bear small red, yellow, or black berries. 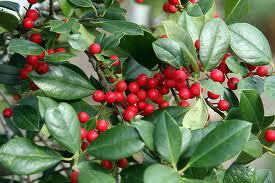 Holly is associated with holiday decoration in temperate regions, retaining red berries into winter. Tropical species fruit at different times but should not be overlooked. Ilex cassine, a native of coastal South Florida and Cuba, is highly recommended as an attractive, subtropical landscape plant and can handle seasonally wet locations. Plant several individuals to ensure a few berry- bearing female trees. Grafting is another means to ensure trees with berries. Florida holly, Schinus terebinthifolius, is an invasive relative of poison ivy and not a true holly. Cuba, Florida. Evergreen tree to 30 ft. +, zones 7-11. Blooms late summer, fall. Seasonally moist to wet/dry. Average soil. Full to part sun. Flowers: unisexual, small. white, berries red. Leaves: oblong, 3-4 in.long, dark green, margins with widely spaced, soft prickles. Highly recommended for lowland landscaping. Tolerates periodic flooding with fresh or brackish water. While narrowly erect in coastal forests, it has a more spreading crown when grown in open locations. Contains stimulant that can be toxic if ingested in concentrated form.